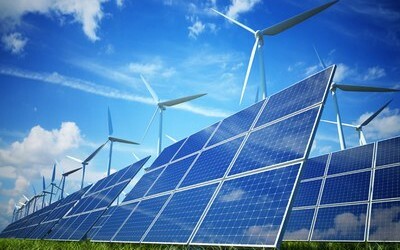 Small businesses, schools and office buildsings will be eligible for solar subsidies for the first time following Council’s decision to triple the solar incentive scheme to $150,000. I was delighted to support this initiative. The State government also matched the investment with a further $150,000 providing an exciting opportunity for us to make even greater progress on reducing carbon emissions in the CBD. See this article in InDaily for more information. Council Committee recommended that ACC investigate redesigning the existing Frome Street Bikeway to provide for two driving lanes during peak hours. I voted against this motion and would rather see Council focus on rolling out new cycling infrastructure – particularly given an Expert Evaluation concluded the project was reducing traffic flow and congestion in the city. The matter generated some media debate. Some of my comments were reported in The Advertiser, InDaily and on Channel 10 and 7 News. This matter was revised the following week at Council. More information on the outcome of that meeting is detailed below. Council Committee also recommended that new restrictions be placed on the operating hours of the RCC and there was a move to mandate the club moving on from Victoria Square from 2016. I shared my concerns with Rip It Up and The Advertiser. The debate continued at Council and moves to reduce operating hours were abandoned in favour of improvements to community access and amenity of the square. See below for more details. 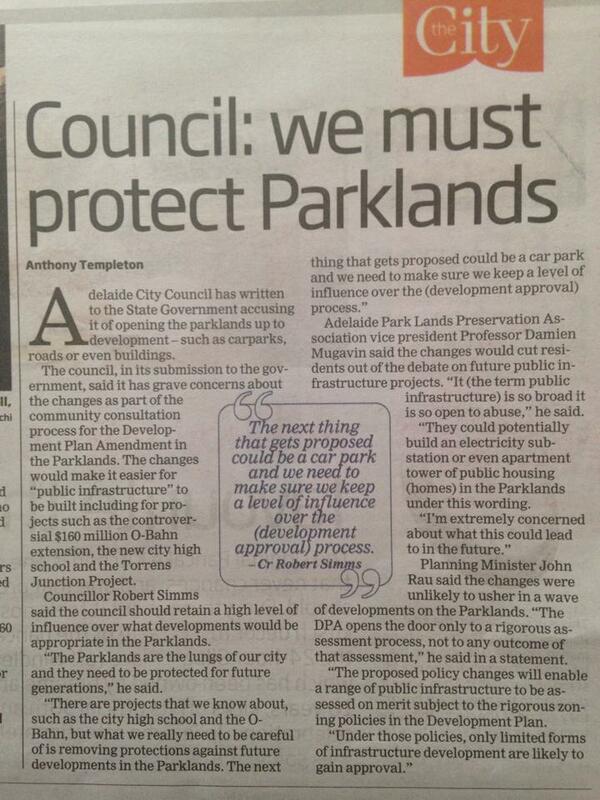 Council has spoken out against Development Plan Amendments in the Parklands. I believe it’s important that we retain a high level of influence over developments to prevent ‘mission creep’ and further encroachment on the land by government. The advice of the Adelaide Parklands Authority is available for access online (see page 61, item 12). 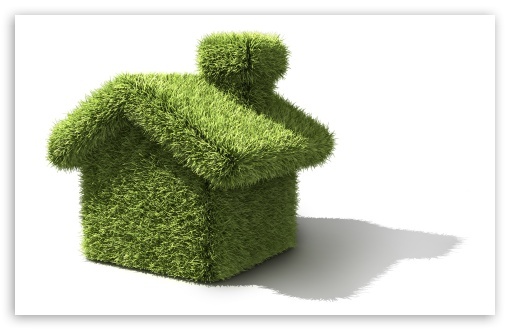 I was delighted to accept a nomination to attend a masterclass on greening in Melbourne on Council’s behalf. This was a valuable visit and I plan to draw on the lessons learned in further promoting greening in the CBD. Councillor Abiad moved the following motion on the RAH site. Notes that the transfer of the Royal Adelaide Hospital from the East End to the West End of the City has potential to have significant and negative economic and social impacts on the East End. Notes that the redevelopment of the East End site (“the site”) offers a significant opportunity to develop a world class precinct that will provide an economic stimulus and social vibrancy to the East End and the City as a whole. 3.3 requesting that a Council and an Administration representative be included in the planning and governance processes for redeveloping the site. Unfortunately this amendment was lost but I will continue to advocate for Council to make the most of opportunities to connect the Parklands to the CBD. The debate was reported in The Advertiser. Councillor Corbell, moved the following motion (on behalf of Councillor Clearihan who was representing Council interstate). I seconded the motion and believe that Adelaide City Council should be a leader in promoting gender diversity. Unfortunately the motion was lost, however some Councillors flagged a desire to look at the issue of improved diversity on boards at a future meeting. Ms Kelly Henderson made a deputation to Council in which she expressed concern at commercial use of Light Square. Ms Sally Neville addressed Council on her concerns about the impact of the Fringe on bricks and mortar businesses. Mr Ian Horne made a deputation following Ms Neville on the same matter. Council then received deputations from Ms Sanja Sierp and Mr Colin Martin regarding the recent Shandong Trade Mission. Dr John Tomic then made a deputation to Council on his concerns about the safety of the Frome Street Bikeway. 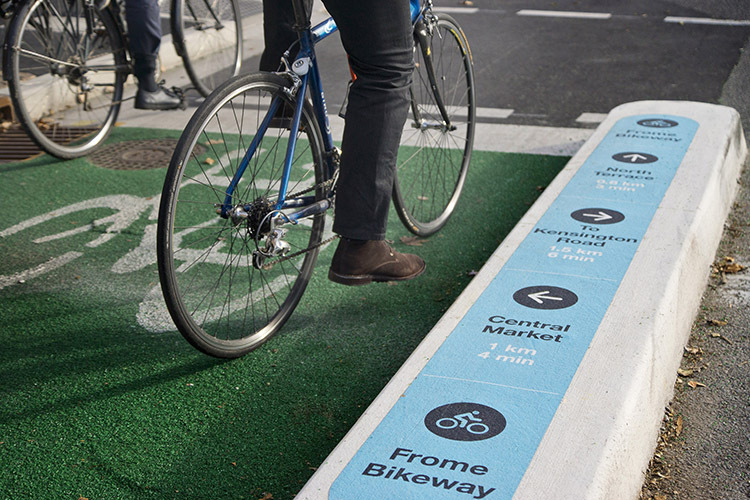 Receives and notes the Frome Street Bikeway Independent Evaluation report – Part 1 included as Attachment E to Item 19 on the Agenda for the meeting of the Economic & Community Development Committee held on 23 June 2015. Receives and notes the Frome Street Bikeway Independent Evaluation report – Part 2: Off-Peak parking Only Design Option, included as Attachment F to Item 19 on the Agenda for the meeting of the Economic & Community Development Committee held on 23 June 2015. 4.8. improved greening and general landscaping in the area. 5.2. the adoption of learning from Stage 1 Frome Street Bikeway and the associated independent evaluation report. Requests an overarching traffic and economic analysis between Carrington Street to the River Torrens and the immediate surrounds be commissioned to assess safety, traffic and parking improvements. That the analysis also investigates and considers the opportunities and constraints associated with the State Government’s O-Bahn City Access Project, Royal Adelaide Hospital redevelopment and the announced High School. Endorse the development and implementation of an awareness campaign for all road users, as outlined in Attachment E to Item 19 on the Agenda for the meeting of the Economic & Community Development Committee held on 23 June 2015. 8.Request that the planning, design, costing and broader analysis report outlined above be presented to the relevant committee no later than 30 Sep 2015to allow consideration and endorsement for wide public consultation prior to final consideration and presentation of the consultation results to Council. My amendment sought to make the improvements advocated in the expert report and then focus on the future. This would have ensured that there was no redesign of the existing separated bikeway and avoided commissioning yet another report into Frome Street. While my amendment was narrowly defeated (by just 1 vote), a majority of 6 Councillors told the meeting they would not support any major redesign of Frome Street. Indeed, the proposal to specifically look at returning Frome Street to four lanes of traffic in peak times as originally suggested was not in the motion put to Council. Council will now receive another report in September looking at options for further improvements to the existing bikeway and its potential for expansion. My view remains that we should heed the advice of the expert evaluation: make the minor alterations the experts proposed and then focus on the future roll out. I remain strongly opposed to any major redesign and believe this would represent a waste of ratepayers’ money. Noting that the budget for the 2015/16 financial year proposes an efficiency target of $3.5m representing 3.6% of General Operating Expenditure, Council directs management to implement a best endeavour target to deliver further efficiency savings of 3.6% of the variable, administrative cost of delivery of Operating Projects and Asset Renewals and the variable administrative costs of Business Operations. I voted against the motion as I was concerned that an efficiency dividend would place unfair pressure on the organisation to deliver more with less resources. Council held a special meeting to discuss the Council’s position on the State Government’s Zone Development Plan Amendment (DPA). Council objected to the DPA and agreed to make a submission to the Development Assessment Advisory Committee requesting that the DPA be amended. You can read Council’s full statement here. Council received deputations from Mr Greg Griffen, Mr John Meek, Mr Anthony Franzon, Mr Greg Griffen, and Mr Stuart Duckworth on the issue of the Royal Croquet Club. 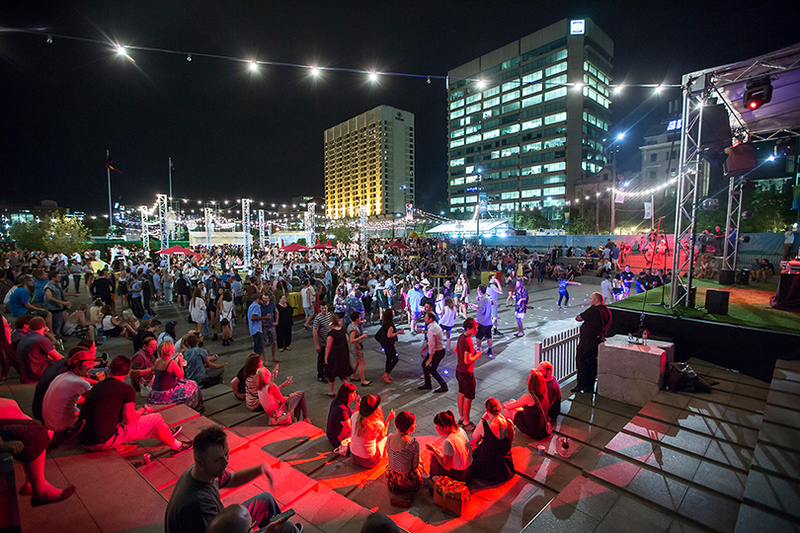 Endorses the use of Victoria Square/Tarntanyangga during the 2016 Adelaide Fringe. Endorses the positioning statement and guiding principles (contained within Item 9 on the Agenda for the meeting of the Economic & Community Development Committee held on 23 June 2015) as a guide for the use of Victoria Square/Tarntanyangga during 2015/16. Notes that the Victoria Square/Tarntanyangga Community Land Management Plan (CLMP) will be amended to reflect Council’s short term position. The amendment was passed. As a result Council agreed to the above conditions proposed by Councillor Antic and agreed to work with the RCC to find an alternative location should they wish to move. 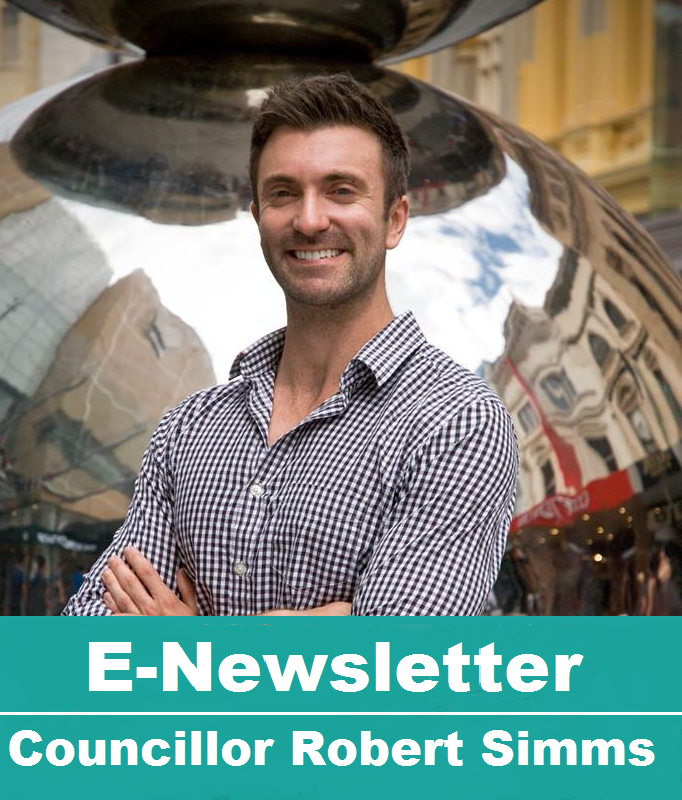 I am supportive of improving community access and amenity on Victoria Square, however I did not want to see Council forcing the RCC from the site or impeding their business by imposing operating hours that were too restrictive. Council will continue to encourage large scale events in the city while working with fixed businesses to ensure they maximise the benefits that can flow from the Festival season. This news report provides a good summary of the debate. I loved your detailed update, but I found the advertising at the bottom of the page a little disconcerting, especially as it was for gambling (this seems to be much more acceptable in SA than in does in WA, where I come from!). I was wondering if, as a representative of Adelaide City Council, you would consider stopping running these ads? WordPress advises that these ads show for 1 of 2 reasons. Either you have expressly chosen to run them, or you are running your site for free and WordPress runs them to cover costs. It is my understanding that either way you do not have any control over the content of these ads. If running these ads is that only way that you can run this website and give the general public access to council information, then by all means keep doing it! If not, please consider a paid membership or withdrawing your approval for running ads your website.